Many of us like to travel by car. Firstly, it is convenient. Secondly, you can gather a group of friends or travel with your family in a car. Thirdly, you plan on your own: how much time to spend on visiting a particular attraction and where to stay. However, if you do not have a personal transport, do not worry, and do not despair - Belarus has a well-developed public transport network (train, bus, minibus) - you can get anywhere, the country is compact. You can also ask the locals for help, they can often give some tips, and help to get somewhere by car. 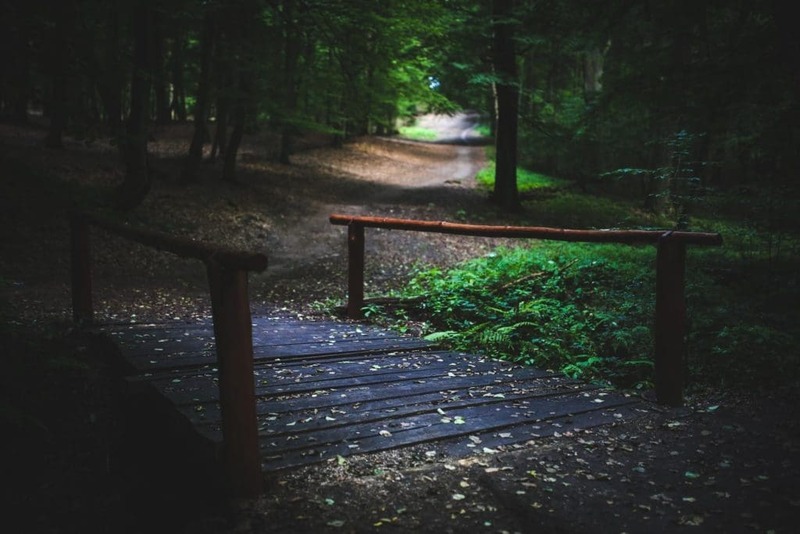 We begin a series of articles about the routes that will be of interest to different categories of travelers: for beginners and for experienced tourists. We will try to find the most remarkable places of the country, tell interesting information about the attractions, but also we will not forget about places where the average tourist seldom visits. If you are interested in military history, you should definitely go to Belarus. The country often became the arena of many military operations, a place where fierce battles for the division of Europe took place. At the beginning of the 20th century, bloody battles of the First World War took place on the territory of Belarus. In Mogilev and Baranovichi, there was a Residence of the last Russian emperor Nicholas II - Supreme Commander-in-Chief of the Army. 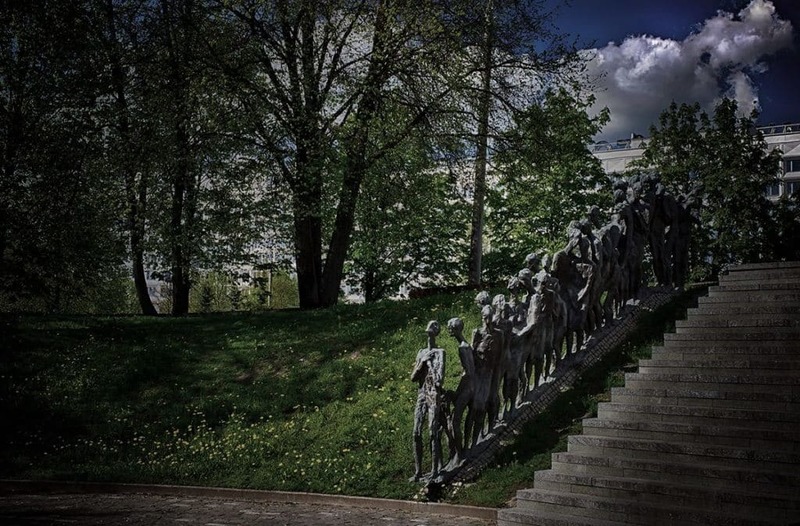 But, of course, the most tragic events of the country are connected with the Great Patriotic War (part of the Second World War that took place on the territory of former Soviet Union), which took the lives of every third inhabitant of Belarus. Our military-patriotic travel can begin both from west to east, and from east to west, adhering to the main international highway M1. We will go to the west and our first stop will be in Orsha, a major railway center of the country, popularly called the "Eastern Gate". It is conveniently accessible from Russia, Europe and Ukraine. High-speed trains run daily from Minsk. If you drive your car, you should note that several international highways M8 (E95) and M1 (E30) pass through Orsha, as well as the Republican roads P15 (Krichev - Orsha - Lepel), P22 (Orsha - Dubrovno), P76 (Orsha - Shklov - Mogilev), P87 (Vitebsk - Orsha). 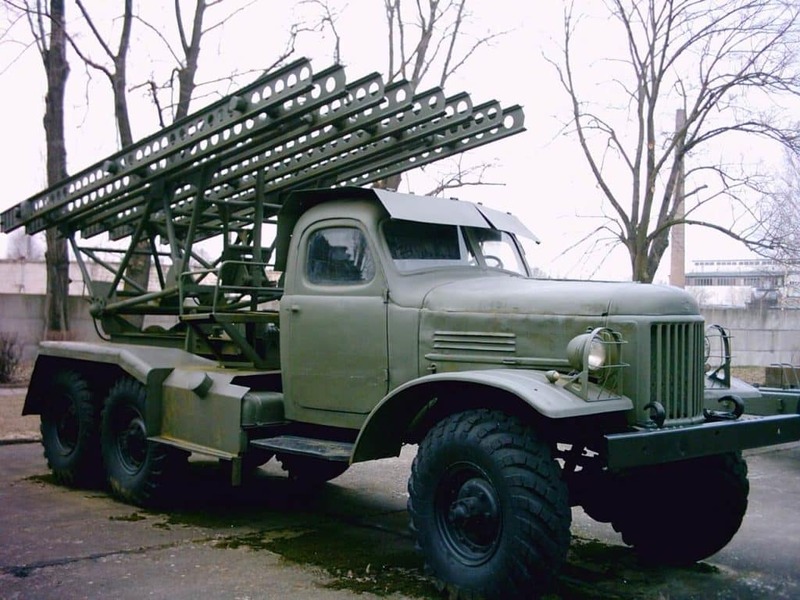 During the Great Patriotic War, Orsha became famous for the first application of "Katyusha" volley fire system (1941). With their help, a strike was made from the location of the 73rd Infantry Division in the village near the railway station. Today, not far from this place, on the steep bank of the Dnieper river, majestically rises the memorial complex "Katyusha". After that, it is worth to go to a small village of Lenino from Orsha, which became famous for its fierce battles in October 1943 (between the Polish Army and the Red Army, on the one side, and the fascist invaders on the other). On the battlefield, a memorial to the memory of the bravery fought Polish and Soviet wars, who died in this terrible battle. Here, its first fight had the 1st Polish division named after Tadeusz Kosciuszko. Also worth visiting is the museum of the Soviet-Polish military community, which has an unusual form of military helmet. Do not rush to leave the Mogilev region: from the village of Lenino you can go straight to the Buinichi field. The field is located near the Buinichi village, south-east of the regional center Mogilev. In 1941, fierce battles took place in this area, which were reflected in Konstantin Simonov's novel "Alive and the Dead". Today, the memorial complex "Buinichi field" is located on this place, which includes an arch-entrance and a 27-meter-long red chapel having hundreds of names of soldiers and militiamen killed in the defense of Mogilev written on the walls. Here is a pond called "Lake of Tears", next to which there are samples of military equipment and weapons. Mandatory stop in the route that you will not regret to visit. 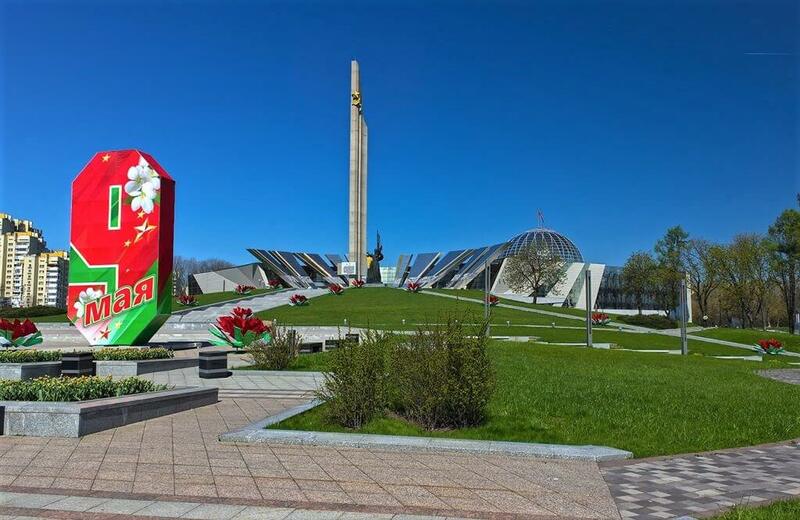 On the way to Minsk on the M2 highway, not far from the airport, it is difficult not to notice the majestic memorial complex "The Mound of Glory". It can also be reached by the city bus and by the shuttle bus, which regularly goes to the city of Zhodino from the railway station. Earlier, in 1944, during the offensive "Bagration" operation, fierce battles for the liberation of Minsk took place in these fields, which were marked by the defeat of the fascist invaders. All this was called the "Minsk Boiler" because of the amount of people killed. 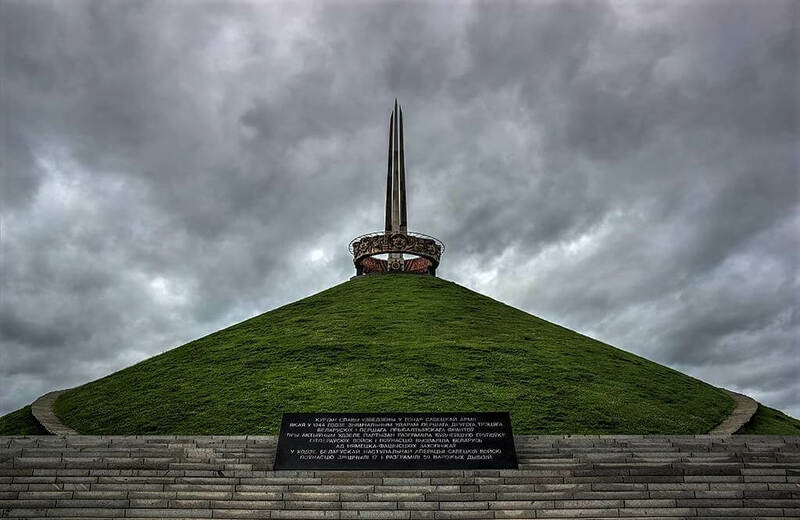 In memory of the heroism of Soviet troops, the mound had been erected from 1966 to 1969: many people, in memory of the dead, brought here handfuls of land. The total height of the memorial is about 70 meters, it is crowned with 4 bayonets, each symbolizing the 1st, 2nd and 3rd Belarusian and the 1st Baltic Front, which courageously, with dedication, fought for the liberation of Belarus. There is also a mosaic laid out on the ring that encircles the bayonets: "Glory to the Soviet Army, the Liberation Army!" Interesting fact: there is a time capluse for the future generations in the foundation of the mound. In the center of Minsk, we advise you to visit the Great Patriotic War Museum (WW2 Museum), which is located in Victory Park. It will be interesting both for adults and for children. One of the main advantages of the Museum of the Second World War is a series of historical episodes, presented in the form of live scenes. Ten museum exposition halls show the chronology of events: from the beginning of hostilities to the complete Victory over fascism. The Victory Hall is the crown of the exposition, the names of the Heroes of the Soviet Union are immortalized in it. In the vicinity of Minsk, in the Logoisk district, it is worth to visit the unique memorial complex "Khatyn". You can reach the place by car, or by minibus in direction to Polotsk (from the railway station). The memorial impresses with its tragedy .... In the center, there is a man with a dead child in his arms. There are streets with chimneys that go from it, the wickets are symbolically opened and ... the bells that ring every 30 minutes at the same time, reminding of the villagers who were burnt alive by the Nazi punitive forces during the Great Patriotic War. What you see makes you feel like diving into the eerie atmosphere of wartime, makes you think about all the horrors of war experienced by the people. Interesting fact: in the Khatyn territory there is the only villages cemetery in the world. 185 graves of unregenerated Belarusian villages that were burned together with their inhabitants during the Second World War. From the capital, let’s go towards Zaslavl along the P28 (Minsk - Molodechno) highway to the Stalin Line (about 20 km from Minsk). Unfortunately, public transport goes seldom here, but the shuttles are regular, you will just have to pay the cost of a full ticket to Molodechno (departure from Druzhnaya station). 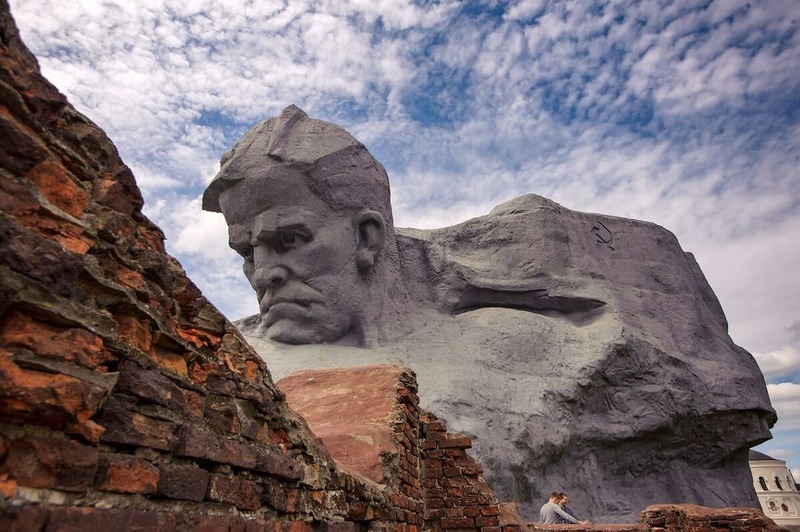 "Stalin Line" is built on the site of the fortification area of ​​Minsk during the Second World War. The historical and cultural complex was opened for the 60th anniversary of the Victory. Here you can spend a whole day. On the "Stalin Line" you can visit the bunkers and trenches, get acquainted with various types of military equipment deployed under the open sky, try firing from combat weapons with empty cartridges, and even ride on a real tank. And, on weekends, you can fly over the complex on the MI-2 combat helicopter. Believe me, “Stalin Line” will leave an indelible impression and will delight the fans of the history of the Great Patriotic War. We suggest finishing your trip with the hero-city of Brest, which is located on the border with Poland, on the M1 highway. The Brest Fortress is the main attraction of the city; it is an obligatory place to visit for every traveler visiting Belarus. Built in 1836, it went down in history, thanks to the heroic defense of the Red Army soldiers from the fascist invaders in 1941, which lasted a whole month (whole Poland was occupied in 2 weeks). At the entrance to the fortress, we hear Levitan's words about the treacherous attack on the Soviet Union and plunge into the alarming atmosphere of wartime. The lyrics of the song "Get up, huge country..." sound like a call for the defense of the Motherland. Legendary were the inscriptions left by soldiers on the walls, the most famous of them - "I'm dying, but I do not give up. Goodbye, Motherland! ". So our military-patriotic route has come to an end, we hope you will use our advice and visit all the main historical sights of Belarus. More information you can see in separate articles about Brest, Mogilev and museums of Minsk. Make sure that you check our article about the top 5 attractions of Belarus.